China House Vision, which opened last week to coincide with Beijing Design Week, is an exhibition exploring how maximum quality of life can be achieved in a minimum amount of space. Following the format of Japan House Vision, it brings 10 architecture studios together with 10 innovative companies. Other Chinese studios involved include Crossboundaries, Atelier FCJZ, Yang House, Atelier Deshaus and BLUE Architecture. There are also two Japanese studios: Hara Design Institute, founded by exhibition curator Kenya Hara, and GHAA, which also contributed to Japan House Vision. Each pair have designed and built their version of the future home, in the form of a one-to-one scale pavilion. These are on show to the public beside the Bird's Nest Stadium in Beijing's Olympic Park. 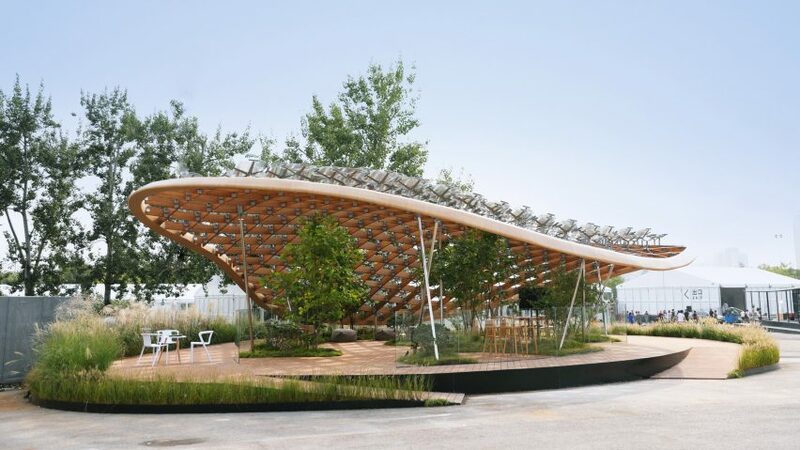 The MAD pavilion, named the Living Garden, follows the studio's philosophy of connecting nature and the manmade. This future home is intended to give the occupants the impression that they are living outdoors. The Living Garden has no walls. A floating, sloping roof structure barely separates the interior world from the outside, while still providing shade and protection from rain. Integrated solar panels sit strategically on the roof to capture as much energy from the sun as possible and can provide enough power for the daily consumption of a family of three. Beijing-based Open Architecture founders Li Hu and Huang Wenjing started the design of their Mars Case pavilion by questioning what the minimum requirements for survival are. The prototype imagines that humans might be forced to settle on Mars, where they cannot rely on natural resources and must live in a self-contained pod that can constantly recycle air, water and energy. The home is formed of two parts: a compact, solid case that houses all the essentials, like the kitchen, bathroom and air conditioning unit, and an inflatable living area. The zero-waste home harnesses and recycles heat, condensation and energy. When on earth, the Mars Case is aimed at a new generation of global nomads, who can use this home to settle anywhere with minimal carbon footprint. Drawing on the traditional structure of a home in Beijing, Penda co-founder Dayong Sun created the MINI Living Urban Cabin with flexibility at the heart of the concept. The micro-home attempts to provide all the necessary comforts of a private home while encouraging dialogue with the community in the city. An open area reimagines the old courtyards of the Beijing's hutong homes. Playfulness is introduced by moveable puzzle-inspired seating, a central swing and a golden periscope through which an inhabitant can gaze out over the neighbourhood. The periscope's mirrors also provide an ever-changing pattern of light in the house. With these nostalgic nods at traditional Chinese living, Sun's Urban Cabin imagines how the past and future meet in the home of tomorrow. BLUE Architecture Studio, founded by Beijing-based Japanese designer Shuhei Ayoma, has created reconfigurable box-like structures that can create both private and shared spaces within existing structures. Believing that homes could be more like clothes that can be changed according to mood and season, the architects imagined a fluid home system that can be used by a young generation of Chinese people to occupy vacant or abandoned buildings in the countries largest cities. The private space is created inside the boxes' five-metre-square interiors while kitchen, bathroom and laundry are all located outside of the box. Sofas, chairs and tables can all be placed in the spaces between individual boxes, creating shared living areas for socialising and studying. The inner walls feature private storage options such as bookshelves, workbenches and clothing cupboards, assembled based on personal preferences. The outer wall can also be made up of these same units, allowing occupants to share books or swap and exchange clothes. The idea for these shared communal areas came from Ayoma's observations that furniture in China's hutongs is already being placed in the streets to create informal public areas. Using the idea of a traditional Chinese courtyard to dictate the form of the house, Atelier FCJZ created the Concrete Vessel to show how concrete could be used to create walls that allow light and air in instead of cutting off the connection to nature. The concrete home is built around an inner courtyard that can be fully opened up to the house. The concrete used for the structure is made from recycled construction debris and is unusually lightweight, allowing air and light to permeate the bricks. The material is used for the outer shell of the building and all internal furniture. Crossboundaries looked at how future technologies might lead to smarter homes and healthier individuals. The studio imagined a smart house run by artificial intelligence. As China and the world's population grows, architects are faced with having to design for density in the urban environment. The China House Vision exhibition attempts to provide intelligent solutions for providing quality of life within a small footprint. This Beijing-based edition of the event pushes collaboration between technology, design and architecture. Kenya Hara launched House Vision in 2013 as a research project that uses the idea of "home" to better understand possible circumstances for future living. The first exhibition took place in 2016, and involved architects including Sou Fujimoto, Atelier Bow-Wow, Kengo Kuma and Shigeru Ban. China House Vision is on show until 6 November 2018 at Beijing's Olympic Park.